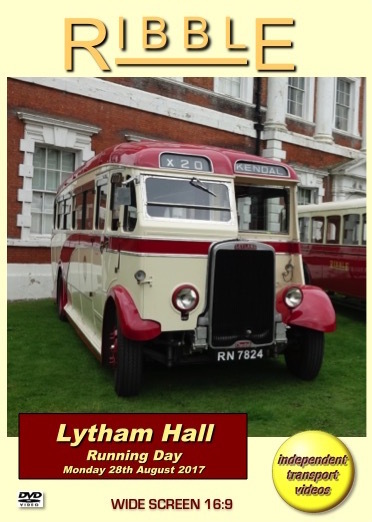 The independent transport videos cameras have been invited back again to record the Ribble Preservation Trust’s fourth Lytham Hall Running Day that took place on August Bank Holiday Monday, 28th August 2017. As usual the event was centred on the magnificent Georgian Grade 1 listed Lytham Hall and it’s beautiful grounds, offering a superb backdrop to the fine vehicles owned by the Trust as well as the visiting vehicles. Our filming begins early in the morning at the RVPT’s Freckleton depot as we see the run out into service of the participating vehicles. This is a good chance to study the vehicles as they are manoeuvred carefully from their sheds and lined up ready for the drivers to take them out. Our cameras board 1775 (RCK 920), a Leyland Titan PD3/5 with MCW FH72F bodywork for the journey to Lytham Hall. We get both the passenger and driver’s views as we motor along the deserted roads and streets to our destination. On arrival at the Hall we see the buses and coaches taking up their positions. A ten-minute service was operated from the Hall to St Annes, via Lytham town centre and Fairhaven Lake. This ensured that preserved vehicles were in sight for most of the day in both towns and along the sea front. We have also captured on film the contemporary buses of the local operators, Stagecoach and Blackpool Transport. This allows us to compare modern vehicle design and livery application against that of the older preserved buses and coaches running in service. Of particular interest are the new ADL400 City double-deckers recently introduced into the Blackpool Transport fleet painted in their new grey and lemon colours of the ‘Palladium’ brand. Our next filming location is in Lytham town centre. We capture the action at the Market Square and along Clifton Street before moving to Central Beach to see the buses running along the sea front. Stagecoach Cumbria and North Lancashire have recently repainted one of their permanent open top Dennis Trident/ALX400s, 17012 (S812 BWC) into a Ribble ‘White Lady’ heritage livery this was in attendance at the event. It can be seen many times throughout this programme adding further interest to this excellent event. It is now time to visit St Annes and what better way to travel than onboard former J. Fishwick & Sons, No.5 (528 CTF), a low-height Leyland Titan PD2/40 with Weymann L58RD bodywork. At St Annes we film the action in and around the Square before boarding open-topped ECW-bodied Bristol VRT, 1995 (OCK 995K) for the ride back to Lytham Hall. This VRT is now owned by the Trust and is currently in the guise of Eastern Counties OT5. With more filming completed at the Hall we have a final run around the route to St Annes onboard 75 (B75 URN), a Leyland Atlantean AN68D with Northern Counties bodywork in the livery of Seagull Coaches, which was new to Fylde Borough Council. Returning to the Hall footage is shot along the lovely long driveway leading to the Hall, offering a super backdrop for these fine vehicles. We film some of the departures from the Hall before boarding 1568 (RN 7824) the beautifully restored 1936 Leyland Cheetah LZ2 with comfortable Brush C31F bodywork for the ride back to Freckleton. This time we have a camera in the cab for you to enjoy the driver’s experience on the journey back to the depot. On arrival we film the vehicles being put away at the end of a perfect day and say thank you to the Ribble Preservation Trust for providing an excellent event, which we hope you will enjoy on this programme.